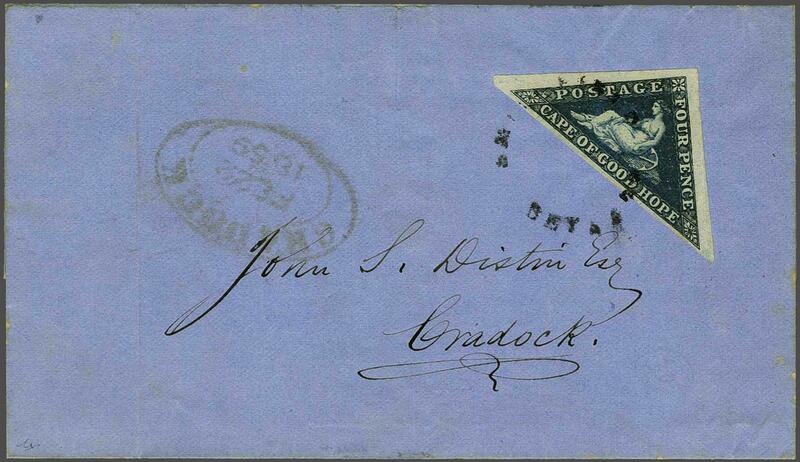 1855/63: 4 d. deep blue on white paper, a used example with large margins all round, used on 1859 cover to Cradock tied by circular Orange Free State SMITHFIELD BETAALD undated circular handstamp in black. Oval framed CRADOCK arrival datestamp (Feb 22) in red at left. File fold well away from the adhesive. A marvellous cover of great beauty and rarity: a unique cover in the foremost quality.rnrnProvenance: Collection Ida Rothschild, Harmers, April 15, 1957, lot 69; where the cover realised £160.